A&D Biker Ministries - "Growing the Kingdom of God . . . one Biker at a time"
Check out the "We're Moving" Link under the "Home" Button! We are not a Biker Club. We are not an Association for Motorcyclists. WE ARE A CHURCH, IN SOUTHEAST WISCONSIN . . . a relevant and contemporary ministry for those who love to ride the open road on 2 (or 3) wheels . . . BUT, we are not "churchy". Our desire is to reach people who may not always feel comfortable in a traditional church setting. A&D Biker Ministries does not have any stained glass or steeples, BUT we are leather and denim friendly! 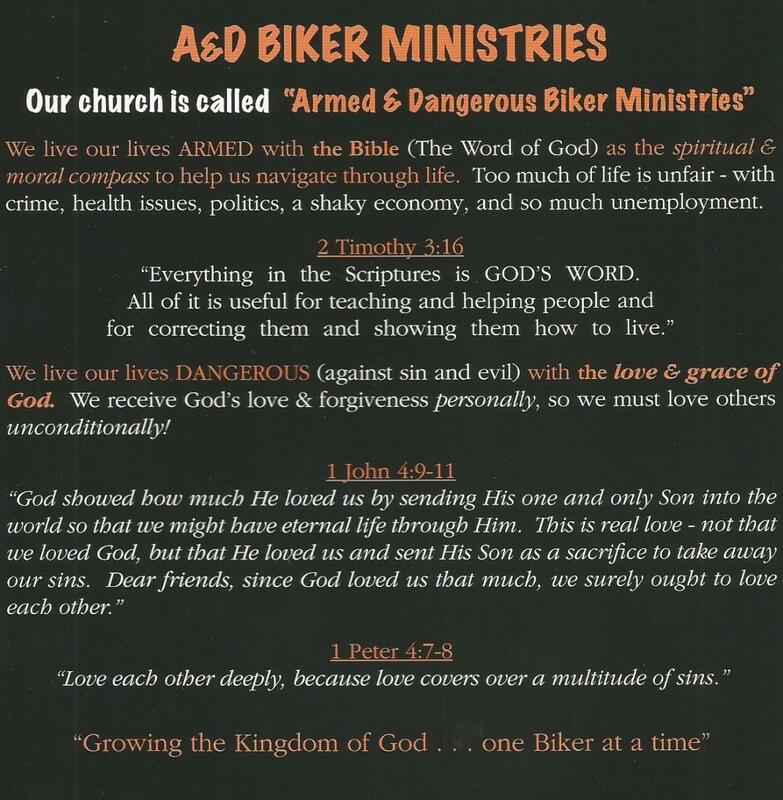 "A&D" is the abbreviated name of our Church: "Armed & Dangerous Biker Ministries" . We are committed to being "armed" with God's Word (the Bible) as the spiritual and moral compass to help us navigate through life. We believe, as the Bible teaches,"Everything in the Scriptures is God's Word. All of it is useful for teaching and helping people and for correcting them and showing them how to live" (2 Timothy 3:16). We also want to be "DANGEROUS" against sin, evil, and spiritual darkness, with the love & grace of God. Our God is NOT mean and angry and unforgiving . . . He is merciful & forgiving & never-ending in His love for us. The Bible says, "God showed how much He loved us by sending His one and only Son into the world so that we might have eternal life through Him. This is real love - not that we loved God, but that He loved us and sent His Son as a sacrifice to take away our sins. Dear friends, since God loved us that much we surely ought to love each other" (1 John 4:9-11), and, "Love each other deeply, because love covers over a multitude of sins" (1 Peter 4:7-8). As we receive God's love and forgiveness personally, we can love othersunconditionally ! WHAT DOES A&D BIKER MINISTRIES OFFER? Worship - Saturday evenings, at 6:30 pm, A&D gathers for contemporary and relevant worship celebrations. With music, teaching from the Bible that really helps us in daily living, and fellowship with friends . . . our worship is most definitely NOT your grandma's Sunday School! And, we are leather and denim friendly. 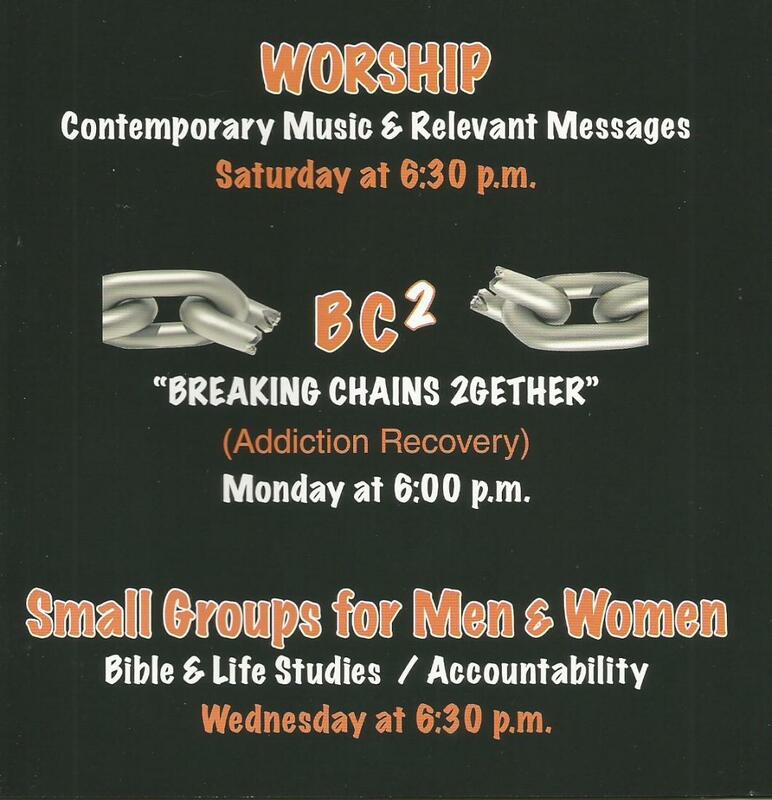 Breaking Chains - An awesome addiction recovery program designed for everyone! Alcohol, drugs, and sexual addictions (to name a few) are addressed in practical and Biblical ways. With appropriate confidentiality AND accountability, B.C. will help lead you to life transformation - not just behavior modification! Small Groups - Available for both men and women, to study together the Bible/life issues/and for mutual encouragement and accountability. What a great way to make new friendships AND to grow stronger in your personal spiritual journey! Emotionally Healthy Living - "Emotionally Healthy Living" is a BIG part of A&D Ministries. We believe that everyone has suffered hurts in life that leave us withemotional scars. Often, we live all of our life through this 'invisible pain' . . . which is very visible in our behavior: anger or rage, the need to control, insecurity, fear, etc. E.H.L. can set you free! <Financial Peace University - Are you tired of living paycheck-to-paycheck? Are you like most Americans, drowning in credit card debt? Then this is for you. "Financial Peace University" is a funny name for a serious course that teaches you how to get out of debt and to LIVE DEBT FREE. Learn Dave Ramsey's principles of sound money management and the 'Seven Baby Steps' toward being able to say, "I'm debt free!" Welcome to the new A&D Biker Ministries website. Click the Login Button in upper right corner. Fill out information form. Only the ones with a red dot are mandatory.